You can now add or remove a freeze on your credit report for free. 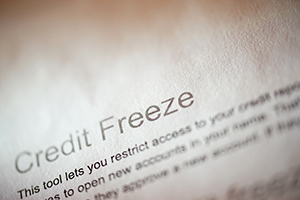 Credit freezes make it harder for thieves to open accounts in your name by restricting access to your credit profile. Prior to a recent change in federal legislation, the cost to place a freeze ranged from free for identity theft victims and senior citizens in some states, up to $20 per freeze in other states. Previously, some states also charged a fee for unfreezing credit. The new legislation now also waives the “unfreeze fee” in every state. In addition to placing a freeze on your own credit report — sometimes called a security freeze — you can also get a free credit freeze for your children who are under 16. And if you’re someone’s guardian, conservator or have a valid power of attorney, you can get a free credit freeze for that person too. To enact your freeze, you’ll need to contact all three of the credit reporting agencies individually — Equifax, Experian and TransUnion. If you request a freeze online or by phone, the agency must place the freeze within one business day. If you want to lift the freeze, the agency must lift it within one hour. If you request your credit freeze by mail, the agency must place or lift the freeze within three business days after receiving your request. You also can lift the freeze temporarily without a fee. The Experian, myTransUnion or Equifax Lock & Alert mobile apps are available through the Google Play Store and the Apple App Store. If you’re not using Wi-Fi, data charges may apply. Contact your service provider for details. Don’t confuse credit freezes with credit locks. They work in a similar way, but locks may have monthly fees. If you want a free freeze guaranteed by federal law, then opt for a freeze, not a lock. As part of the legislative overhaul, fraud alerts will still be free. A fraud alert tells businesses that check your credit to contact you before opening a new account. Now when you place a fraud alert, it will last one year instead of 90 days. Identity theft victims can still get an extended fraud alert for seven years. Be proactive and add a credit freeze if you have been, or think you might be, at risk of identity theft. Here’s how you can protect your Social Security number from the latest attempts by scammers to steal it. Learn how you can make choices about how your personal information is collected, shared and stored. Contact us if you are a member and a federal employee who needs help during the federal government shutdown. More plans, lower premiums and added benefits are just a few of the changes Medicare recipients will see in 2019. This event is in conjunction with Keep America Beautiful. This event is in conjunction with Keep Randolph County Beautiful. This event is in conjunction with Vance County's Household Hazardous Waste Collection Day. This event is in partnership with Pamlico County Register of Deeds.